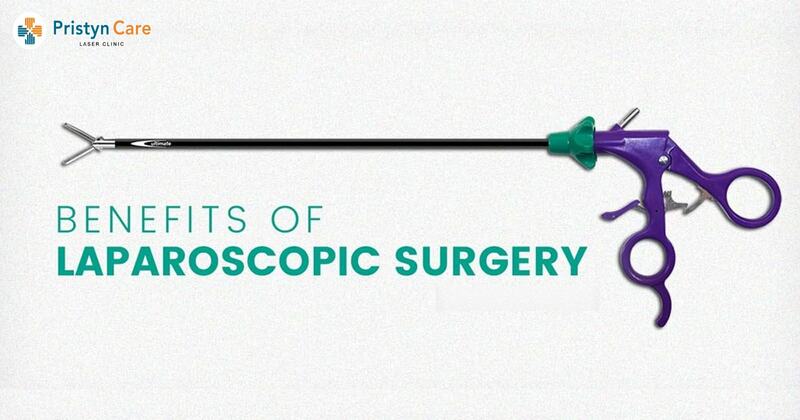 Laparoscopic surgery is a surgical technique in which surgery is done by making a minimal incision in the body. The technique is also referred to as Minimally Invasive Surgery or Keyhole Surgery. Laparoscopic surgery is performed with the help of a laparoscope, a thin fiber-optic tube with a miniature video camera on its tip. The tube is inserted into the body through the cut made in the skin, and the camera images are available on the linked monitor. The risk of bleeding during laparoscopic surgery is less because the size of the incision made is very small as compared to the large incision in open surgery. This decreases the possibility of a blood transfusion being required for any blood loss. The smaller incision (cut) size decreases the risk of pain after surgery and the patient doesn’t need long-term pain relief medications. The small incision leads to the formation of a considerably smaller scar after surgery. In larger surgical wounds, the scar tissue that forms is more prone to become infected and more vulnerable to herniation, mostly in overweight and obese patients. In laparoscopic surgery, exposure of the internal organs to external contaminants is considerably reduced as compared to open surgery, hence decreased the risk of post-operative infection. The period of hospital stay is notably shorter with laparoscopic surgery, as the healing process is much faster. Usually, patients get a same-day or next-day discharge and can return to their normal lives much more quickly than after an open surgery technique.